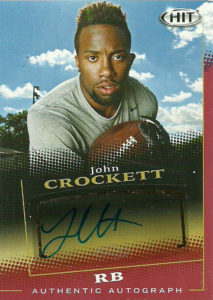 A really nice card of runningback John Crockett here. The clean photography and contrast really hearken back to the days of early media photography. The 2015 combine positional leader in both the vertical jump and the broad jump, John Crockett has many of the athletic tools to make the jump to the NFL level. Playing for North Dakota State, he rolled up the yardage (4339 yards) in only 3 years with the Bison. Thanks to the stigma against players in small school conferences, Crockett did not turn very many heads, but still warranted enough interest that he was drafted by the Green Bay Packers in the 6th round of the 2015 NFL Draft. After an impressive preseason, Crockett made the squad and was a back up for Eddie Lacy and James Starks. He saw action in 2 games rushing 9 times for 21 yards. John injured his shoulder in 2016. He spent the entire season on IR rehabbing. In 2017 he was not tendered by the Packers and became a free agent.